I work in the Marketing Department of ArtisTree Landscape, so naturally I’m fond of a million things you can plant in the ground. But I also have an indoor favorite that I eventually like to take outside and nestle up in my trees, and it usually requires a trip to fill up my gas tank. You see, my favorite weekend pastime is to drive to local orchid nurseries in search of the next perfect orchid specimen for my home orchids collection. My search is typically for colors and combinations not found in big-box stores – a delicate burnt orange, a rich, deep black or a vibrant purple. But I don’t like fussy plants. So I focus on Phalaenopsis orchids. In my experience, they are one of the easiest to grow inside or out on the lanai. With just a little care, they’ll will reward you with several months of beautiful blooms year after year. 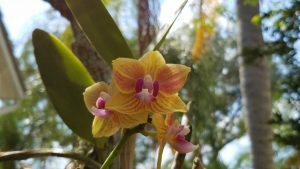 Here’s what I’ve learned about “Phals” and other orchids. Their root structure differs from typical houseplants, which have a central root system that grows down into soil to absorb moisture and nutrients. 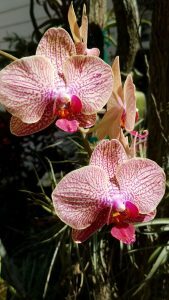 In contrast, most orchids grown for the home are epiphytes. Rather than grow into the ground, epiphytes use their roots to attach themselves to trees, rocks or potting medium where light, air, water and nutrients are more abundant. The thick roots of Phalaenopsis require a more open and less dense potting material (often an orchid bark medium) and can generally be watered once a week. Orchids potted with moss need to feel dry before watering again. If in doubt, wait a day, but whatever you do, don’t plant your orchid in soil or dirt because it will rot. Be sure to let the plant drain completely. If any water remains in the crown (where the leaves join in the center) use a paper towel to soak up the water. Phalaenopsis are “low light” orchids. Their leaves should be olive green (darker leaves mean they’re not getting enough light; red tinged leaves mean there’s too much light). You can place them anywhere in your home out of direct sunlight in a room with a temperature between 70 and 80 degrees. You can use any balanced orchid fertilizer (think 20-20-20) to nourish your orchid weekly. When their exquisite blooms are finished, cut the spikes down to the level of the leaves so they’ll bloom with larger flowers within a year. I typically move my bloom-less orchids outside to the crook of a tree branch and secure the bottom with knee-hi hosiery or breathable garden twine. Then I make a deal with Mother Nature. She can water while I fertilize. My patience waiting for the next blooming cycle to begin always pays off, with my orchids slowly but surely popping out buds beginning mid-April and throughout May. Each spring I sit at my window wondering what color will appear next as I gaze at the beauty and delicate nature of these exquisite plants. Perhaps you’ll want to go on your own orchid hunt and try your hand with a “table to tree” Phalaenopsis. It’s easy and immensely gratifying. 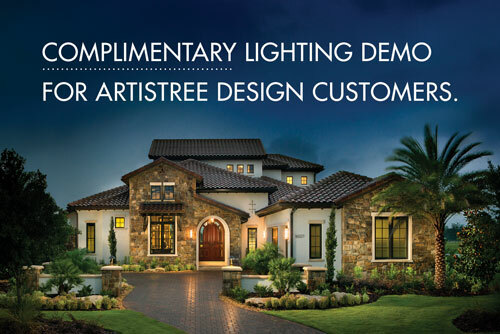 Call ArtisTree Landscape Maintenance & Design at 941.488.8897 or click here for more landscaping tips. You did a stellar job done to clean up the community after Hurricane Irma. Board members and residents alike were thrilled with the work and the expedient service being delivered!